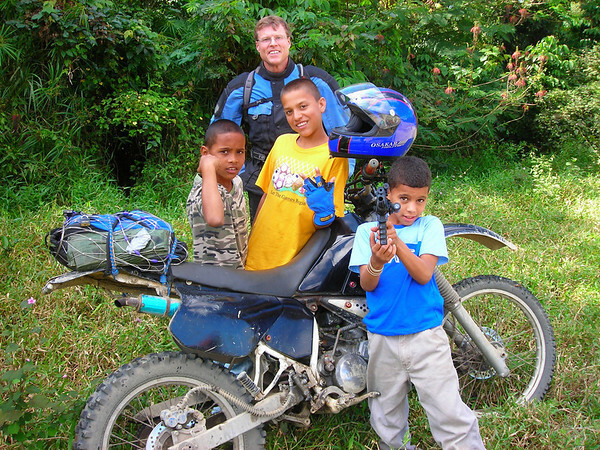 Tom & Tom, MEGA Dominican Republic Motorcycle Adventure continued. 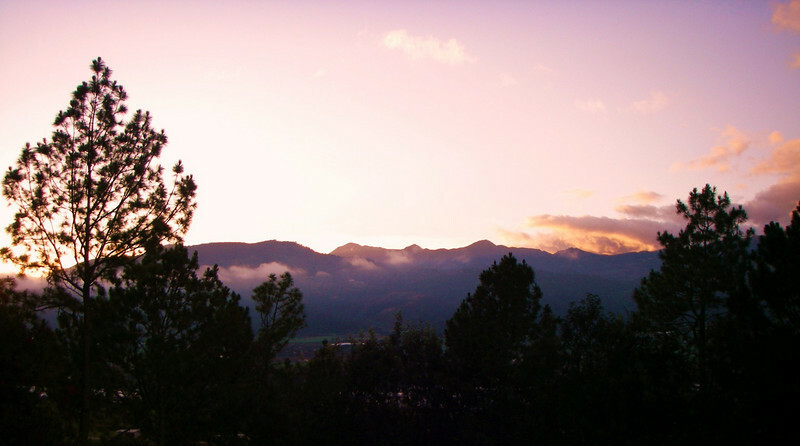 Today we wake-up in the town Navarrete, just miles from the start of the autopista, the main freeway running down the center of the country, north to south. 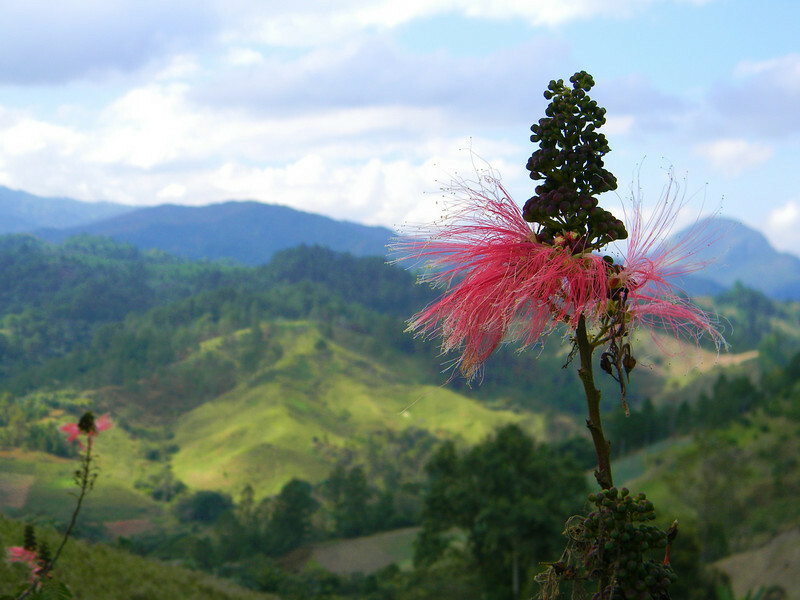 We are shooting for Jarabacoa and Constanza today, way up in the Cordillera Central Mountains. First, we will start running down the autopista, then up the paved road to Jarabacoa. My goal was to stay off the autopista, but we are far behind schedule and now want to make up a little time. Behind schedule is not exactly a bad thing here, in fact, I pretty much expected it based on the routes we chose. I am a firm believer that any motorcycle adventure that stays on schedule and everything goes as planned, started with a tame plan in the first place, not what I do. Anyway, Tom and I are engaging in discussion about what parts of the island we are going to skip and what parts we definitely still want to ride. There is really nothing wrong with riding the autopista, except for the fact it is hard to get lost. (Do I need help!) 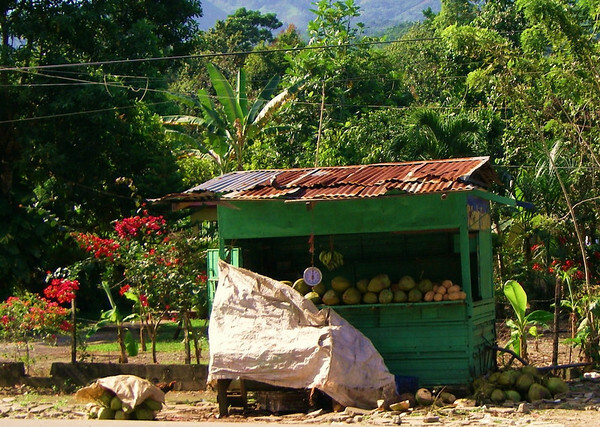 The sights are beautiful, you pass local stands selling homemade clay pots, large wooden carvings, fruit and there are numerous opportunities to indulge in good Dominican food. When we woke today, there was no coffee in sight at our hotel. Our first mission after getting on the road is to find coffee and food. 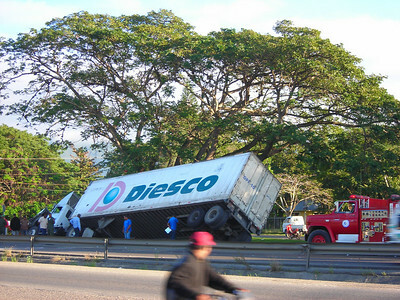 After passing this wreck, I see a small open-air road restaurant loaded with good -looking Dominican food. 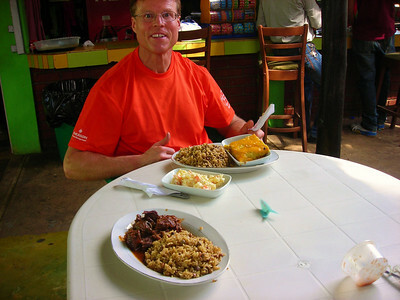 I order two coffees, scrambles eggs, fried cheese and a mound of mangu topped with red onions. (Mangu is a Dominican dish that resembles green mashed potatoes. It is a good source of complex carbohydrates) Tom orders coffee. I tease him about being on a diet. He has no comeback. The autopista runs straight through Santiago, the second largest city in the country with a population of several million people. Somewhere, I miss a turnoff. We find ourselves on a road that peters out to nothing on the outskirts of town. I know Tom has to be hungry. I see a fruit stand so I pull over to talk about our situation. We buy some fruit. The owner of the stand gets two chairs for us to sit on while we eat. He asks about where we are from and what we are doing. He looks surprised when I tell him all the places we have been to and the places we are going. This is another great stop. We backtrack into the heart of Santiago trying to see where I screwed up. When we get to the first major intersection, I think I see where I goofed up. I pull over behind a parked taxi. 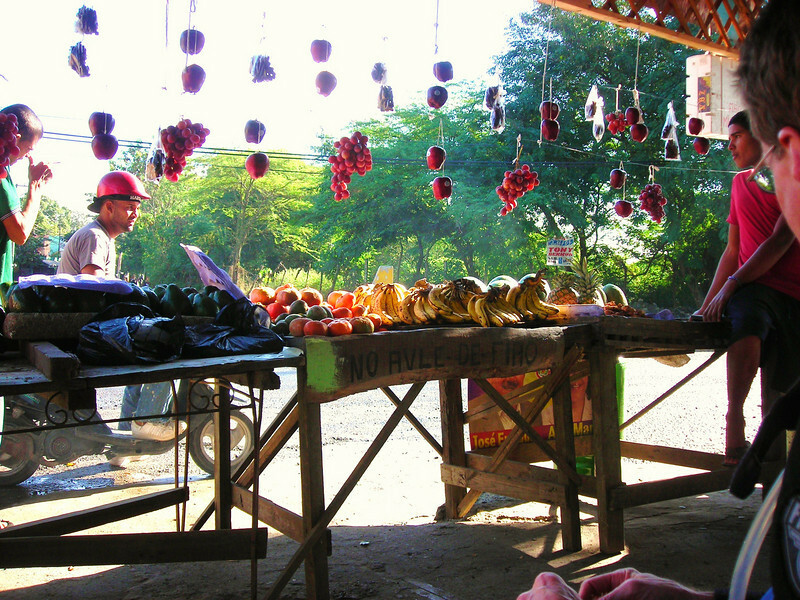 I jump off the bike, take off my helmet and ask the taxi driver, in my best Spanish, how to get to La Vega, the next major city along the autopista. He rattles out directions then indicates for us to follow him. I jump back on the bike. The taxi takes off with a client onboard. Several blocks later, he sticks his arm out the window, indicating for us to turn here. Sure enough, it is the entrance to the autopista. Sweeet! Good karma or just good luck, I am not sure but I will continue with my random acts of kindness. 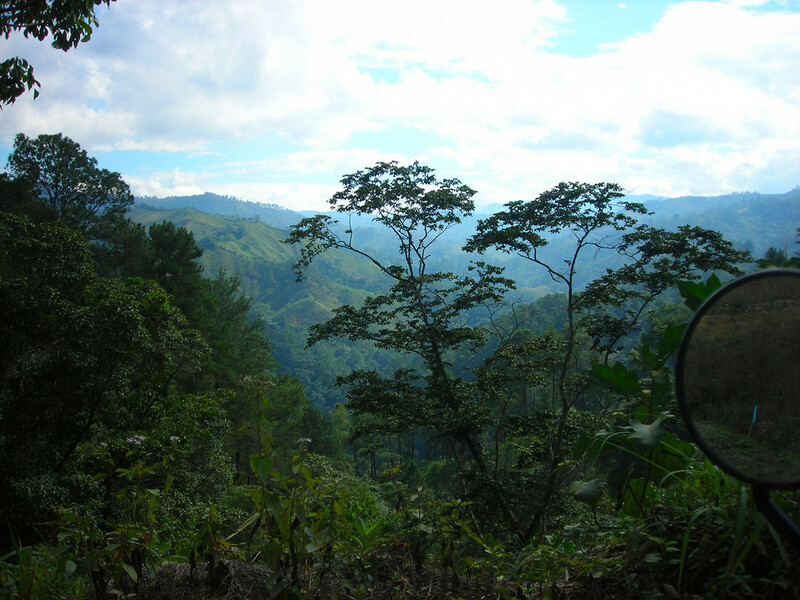 We continue to sail down the freeway heading toward the steep mountain road that leads to Jarabacoa. We pull over for gas. I fill up with premium gas as always. Tom fills with regular. I cannot believe my eyes and tell him so. “The guy who rented you the bike told you to use premium! He said it runs better and gets better mileage with premium!” I guess I am not surprised, Tom would constantly fill his Harley Sporster with regular gas when we rode together, to save money. I could never understand it then and I would never hesitate to tell him so. But now, he is riding a 125cc motorcycle into the mountains on regular gas. I tell him that I do not think the twelve cents you saved on the gas is worth it here. Tom argues that premium gas doesn’t make any difference. 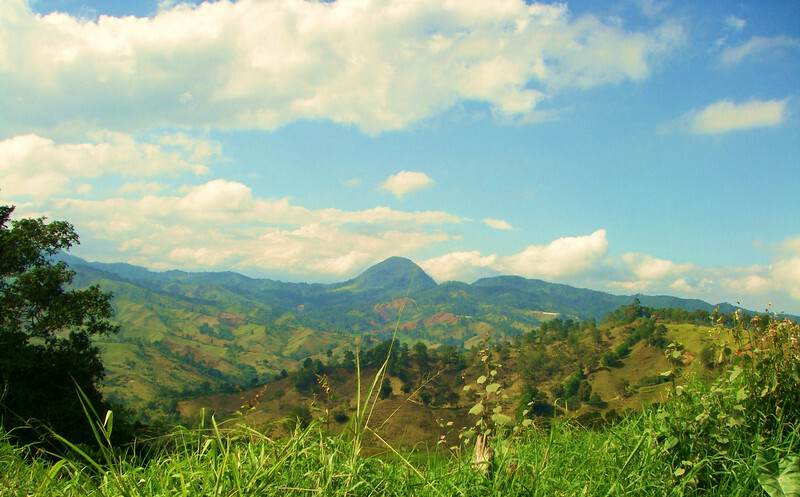 “OK….” We ride on, up the steep and twisty mountain road toward Jarabacoa. Half way up the mountain, I pull over at a mini-mart ‘colmado’. Tom is having a hard time keeping up. He finally pulls in behind me. We rest and hydrate. All is good. Tom starts squirting water from his camel back onto his motorcycle’s cylinder head cooling fins. I cannot help myself and say with a wide grin “A motorcycle engine runs cooler with premium gas…” Tom says nothing. The higher we rode the harder it was for Tommy to keep up. I slowed down trying to keep him in my rearview mirror. 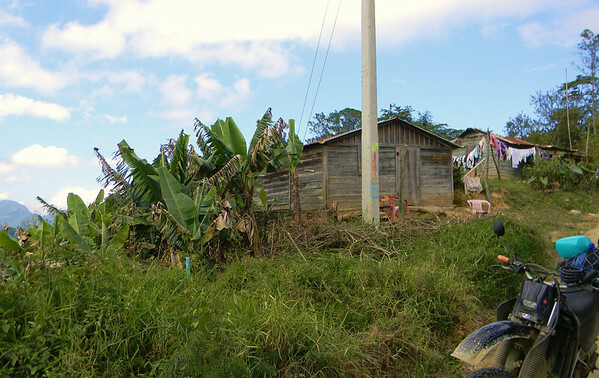 We pull into Jarabacoa. Tommy tells me he wants to find a motorcycle shop to install his new spark plug. We find a shop in no time. I tell Tommy that when I replaced my worn plug I definitely gained power. The plug is in. Tom and his mechanic are happy. I know a trail along the river running through Jarabacoa. I suggest we ride there and discuss our options. 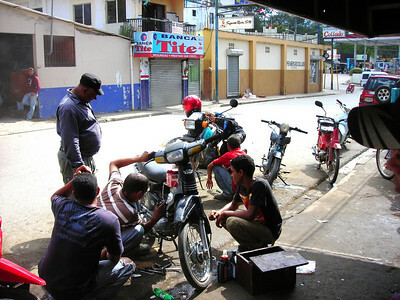 We plan to ride past Jarabacoa today to the highest part of the mountain, but it is already getting late, I think we should talk about heading to Constanza now. 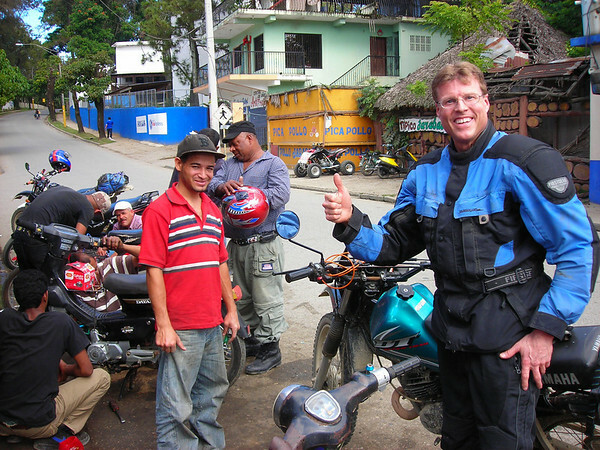 We plan to ride the rough mountain dirt road to Constanza but I tell Tommy that the last time I tried that route the road was under construction and closed to through traffic. Tommy agrees we concentrate on getting to Constanza, now. Military check point midway between Jarabacoa and Constanza. The road improves the further we ride. We can feel the road going down in altitude. An official looking truck passes us then stops. The driver is sticking his arm out the window motioning to us to stop. We stop. The truck driver informs us that the road is closed ahead and we cannot get to Constanza on this road. What a nice person, his ‘heads-up’ maybe saved us an hour or more. Oh well, it is a great ride anyway. 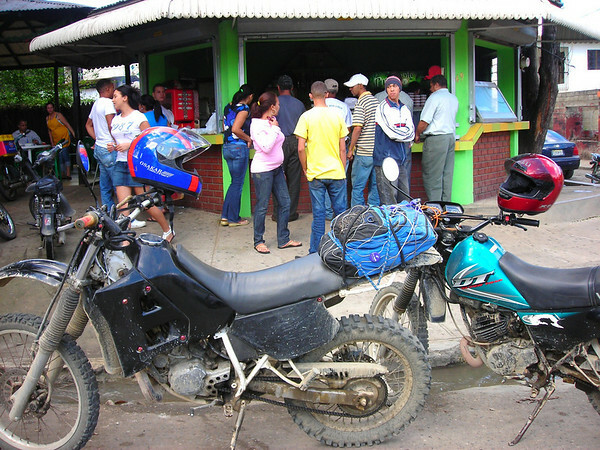 Now, we need to ride back to Jarabacoa, then back down to the autopista, south on the autopista to the paved road that leads to Constanza. We need to hammer it, we don’t have a lot of sunlight left. OK, the plan is set. 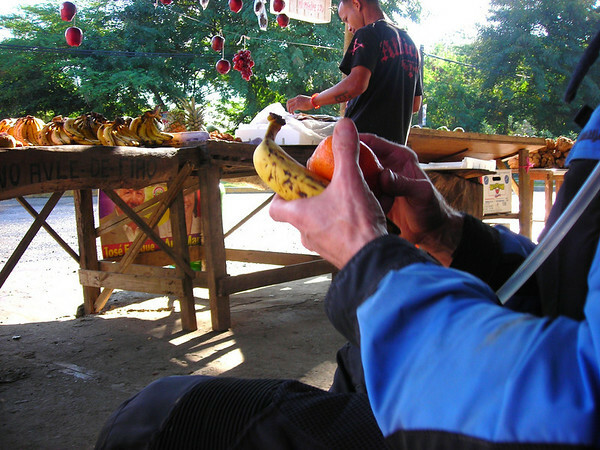 Tom is worried about his rear break and wants to take it slow back down to Jarabacoa. He tries to use his engine to slow him down but the 125cc 2-cycle motor does little good. 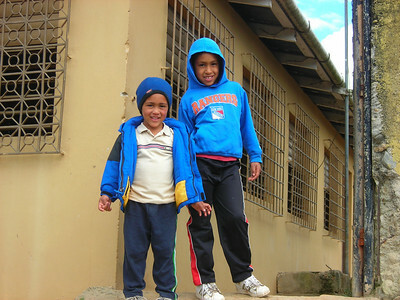 We make it to Jarabacoa. Tommy asks for my wrench to see if he can get anything more out of the rear break. He says it helped a little. I suggest we install some new break pads. Then I say with a grin “That might cost you five or six bucks though” We push on down the mountain. At the bottom, I pull in for gas. Tom rides up. His eyes looked as big as golf balls. He says “This bike is shot! The breaks are gone! Let’s forget Constanza” I am disappointed to say the least. 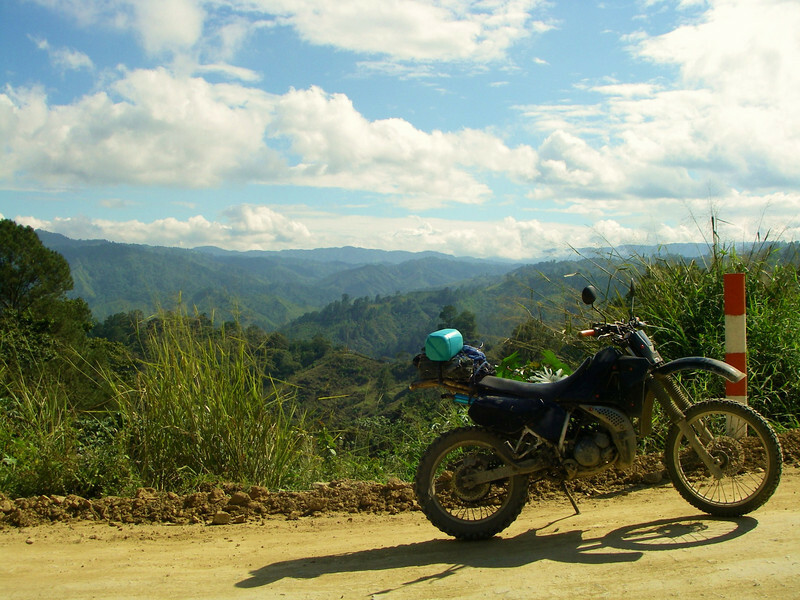 The dirt road leading from Constanza to the Southwest corner of the country is reported to be the worst of the worst roads in the Dominican Republic and was going to be a highlight of this ride. But, I had to agree, if Tom is not comfortable with his bike, that is all that matters. This is his ride. I can always return later and attempt it alone. Plan-B: We have learned that non-tourist towns have no hotels for travelers, they just do not exist. I remember while reading the guidebook about the city Bonao, Bonao has a recommended hotel. 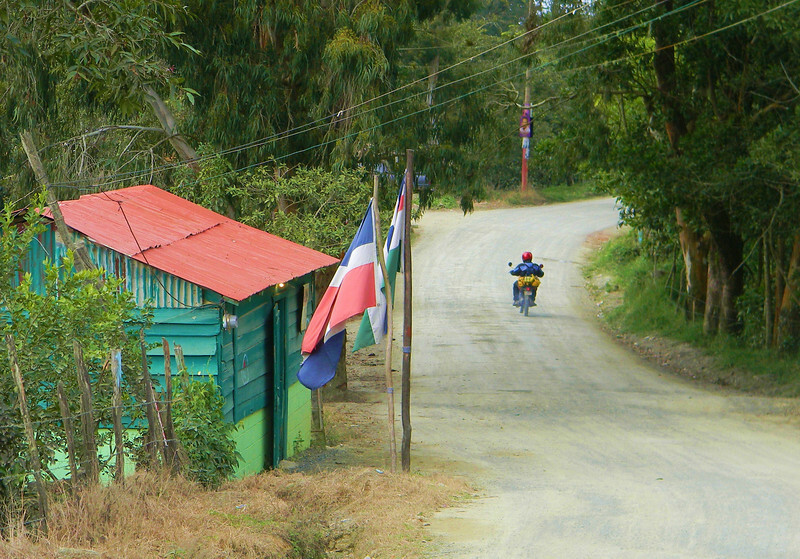 We push south along the autopista toward Bonao. We ride into town, pull over and get out the guidebook. The book talks about one good hotel and says that the budget hotels here are not good, meaning ‘by the hour’ type. We ride to the center of the buzzing city. I pull over and ask someone if he knows this hotel. He taps his friend on the shoulder, who was sitting on his motorcycle and tells him to lead us to the hotel. How nice was that! We are lead to the hotel. We thank the person while waving goodbye. Super, that was easy, we thought. I walk into the hotel to get us a room but the hotel was 100% full. Crap! But, the receptionist tells me, in English, that there is another hotel on the autopista. He tells me to go back to the autopista, turn left and down the road is the hotel. I double confirm. Autopista, then left, hotel. Yes! I inform Tom, we ride back to the autopista, we turn left and begin to crawl along the shoulder of the road looking for this hotel. 2 or 3 miles later we come across a small hotel that is closed and looks like it has been closed for a while. We crawl on, still looking. I see someone standing on the side of the road. I ask about a hotel. He tells us to exit the autopista just up the road, then up and up. Or, at least that is what I think he said. 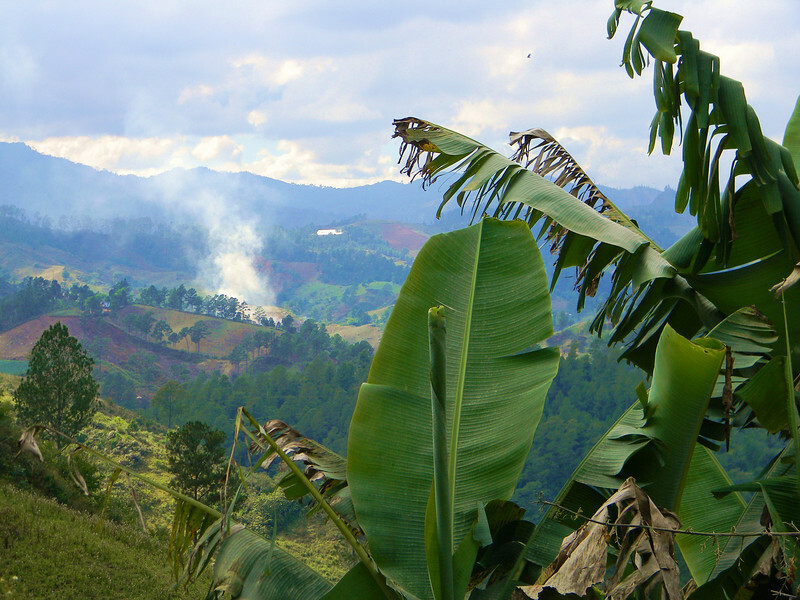 We ride a short distance then exit on the road leading to, yah, you guessed it, Constanza. I inform Tom that I think I remember a hotel just a short distance up the Constanza road, otherwise I know a great camping spot. Tom wanted to turn back and keep looking for this mysterious hotel. It was getting late. I repeated “I will not ride in the dark. If we can not find a hotel up here we need to camp” Tommy agrees. We push on up the mountain. We ride up and up and up, no hotel. We continue up and up, switchback after switchback. I find the camping spot and pull over. Tommy doesn’t see me and almost rides right past. I scream out. He stops. The last time I was here, I rode off the main road up a short steep lip to a ridge overlooking the valley below. This time there is hand-strung barbwire across the entrance to the ridge. Tommy and I go check it out on foot. If we could get the bikes up here, we could hide them and camp out of sight from the road. We walk back to the bikes and talk about our situation. We see a motorcycle riding down the road with two people wearing military fatigues. One guy was carrying a rifle. As they passed us, the person on the back looks at us and shakes his finger at us, meaning ‘don’t even think about camping there!’ Woah! 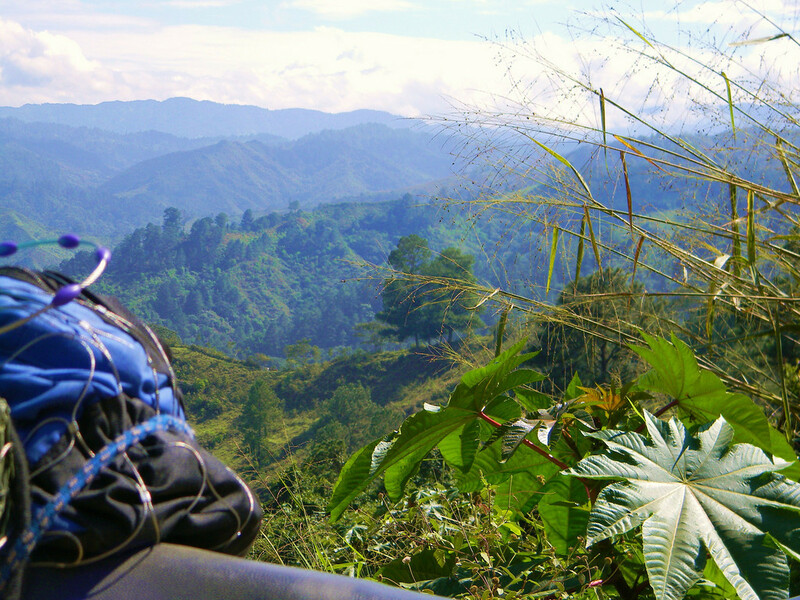 Tommy and I formulate plan-C. We continue to ride toward Constanza while looking for a hotel or a new camping spot. We climb and climb. It starts raining and we are loosing light fast. Toms headlight goes out. My engine quits from the rain. I tell Tom to keep going, and say “I will catch up” I dry off the sparkplug with a napkin. No luck. Next, I pull out an old trick I have used in my youth. I learned it from my high school shop teacher. I pull off the sparkplug cap, them lightly put it back on the plug so the conductor does not touch the sparkplug tip. The theory here is that the voltage from the ignition coil will build up to its highest point, jump to the sparkplug tip them jump the plug gap of even a fowled plug. That worked. I blast off attempting to catch up to Tom. I reach the top of the mountain, no Tom yet. I buy some homemade sweets from a woman at the observation area. I push on. 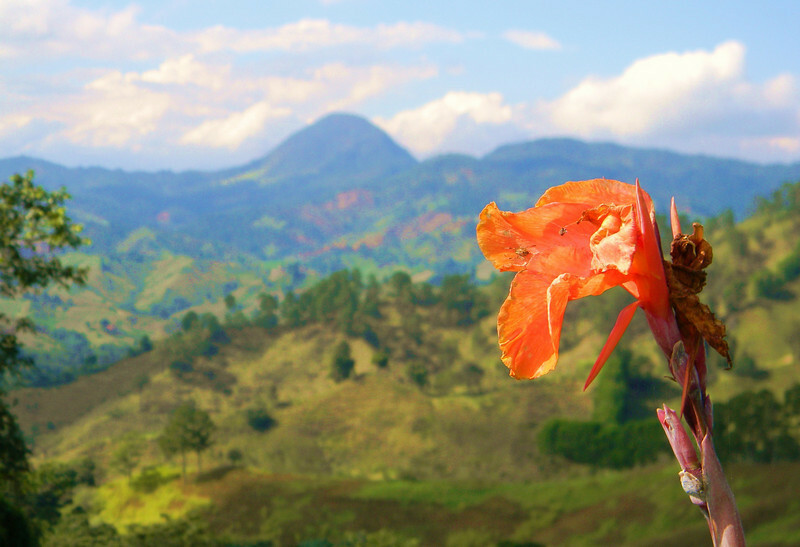 Rancho Constanza, we get the best room in the place, a suite on the third floor with a wide balcony overlooking the Constanza valley and all the light of the city. We see fireworks shooting off in the distance. I am on the phone with Cavegirl and she informs me that it is the Dominican holiday, Epiphany, cool! The beer went down quick. Tommy thinks we need more beer. I agree. We walk back down to the general store. We hang around outside the store drinking beer with several others. Upstairs is an open-air disco / pool hall. While drinking, we notice some girls waving at us and giggling. Not many gringos visit this area. We wave back. Soon a young couple came down from the disco to talk with us. The girl asks where we are from. She says she lives part time in Texas. They invite upstairs to play pool. How nice is that!